Welcome! Let us make your job finding guests and interview sources a LOT easier. "Guests Available" expert interview offers easily by email - free! Authors, experts, and even celebrities of all types list on our website and in our emails because they want to appear on your show or in your articles! Sign up for free TODAY and start getting easy interview booking listings TOMORROW. >> Or, are you an expert or author looking for interviews? Learn how to list your expert credentials on this website here. 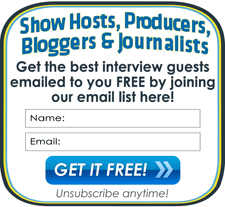 Or, sign up for the free interview "Guest Request" emails here.